I'm getting close to my 50,000th visitor. This is pretty exciting for me since I started this blog less than 11 months ago. It looks like it will happen this week. Here's how it works, take a screenshot of my sitemeter when you think you're close to being the 50,000th visitor. Send it to me in an email and if you're the closest one to the magic number, I'll send you your choice, hat or shirt. (Of course you will have to provide your mailing address if you're the winner). Here's a photo of the lovely SondraK, modeling one of the ballcaps. My Blogfather "Ace of Spades", my inspiration for blogging, and for his many links. Wuzzadem and Mrs. R at Are You Conservative, the first people to blogroll me. The Mayor of Mitchieville for Links and Laughs. Difster, Digital Brownshirt and In Deo Veritas - My Blogbuddies. 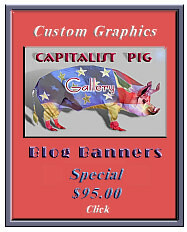 Pete at iHillary for designing my Banner. Dave at Garfield Ridge for general Monkey Business. The Stupid Shall be Punished, the other Idaho Blogger. Survival Blog, Gullyborg at Resistance is Futile and e-Claire for links and advice. Partisan Pundit and Geek Soap Box for the link-love. Chris at Day By Day and Mike at Ipso Facto for letting me increase my entertainment value by putting their cartoons on my blog. And... Neal Boortz for the Boortzalanche that got me 14,000 visits in One Day. Most of all... Thank YOU for visiting. When you hit the 50,000 mark, you get a free image of your choice. Yes, that includes Paris Hilton. Well, I don't know if I was or wasn't, since I get "connection refused" to "sitemeter.com". My security system must think sitemeter.com is a virus, or spreading trojans or spyware, or something else evil. Does an image of Angelina Jolie on my face count?